The Avatar AVB is a 3.7V high-drain 21700 li-ion battery with 4000mAh battery capacity and 30A constant discharge current. 1pc each package. 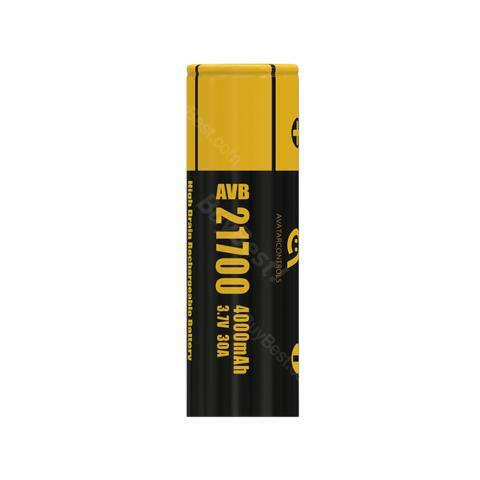 The Avatar AVB is a high performance 21700 lithium battery with 30A maximum continuous discharge current and massive 4000mAh battery capacity. It can be recharged too. The Avatar AVB has light weight and high energy density, so the power still remains 80% after 1000 cycles. Just get this battery for a long-lasting vape! • Compatible with most 21700 MODs. Try Eleaf iStick Pico 21700 Kit with AVB battery.